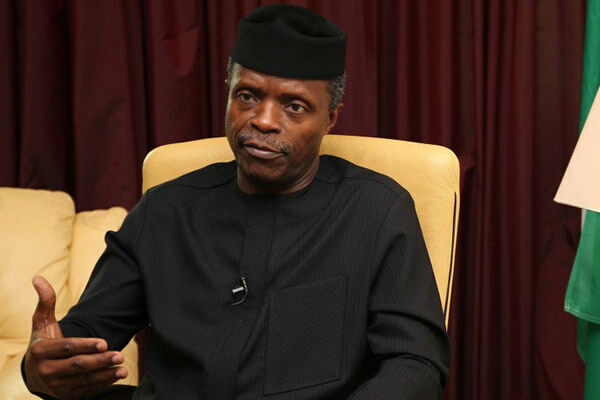 ABEOKUTA—Vice-President Yemi Osinbajo, yesterday, promised Nigerians that the Federal Government has set machinery in motion to ensure 7,000 megawatts at the first quarter of 2017 . Osinbajo, who acknowledged that the country was battling with 3,000 megawatts, assured that the 7,000mw is achievable. The vice-President said the Federal Government is currently working on nine transmission stations across the country towards achieving that set target of 7, 000 megawatts electricity generation for the country. He however, attributed the crisis in the power sector to the vandalisation of the folcado terminal and four other export terminals is responsible to the reduction in the megawatts to as low as almost 2500mw of power . The VP who said this in Abeokuta, the Ogun state capital while declaring open, the 8th Session of the National Council on Industry, Trade and Investment, adding that the work on the critical transmittions would be completed by the first quarter of the year 2017. Meantime, former President Olusegun Obasanjo has called on African countries to explore trading opportunities within the continent as part of efforts to boost their economies. Obasanjo made the call yesterday when a delegation from the National Council on Industry, Trade and Investment paid him a courtesy visit at his hilltop mansion in Abeokuta. The delegation led by the Minister of Industry, Trade and Investment, Dr Okechukwu Enalamah, included the Minister of State for Industry, Trade and Investment, Aisha Abubakar, and members of some committees of the National Assembly The delegation was in Abeokuta for the eighth edition of the council’s meeting with the theme “Diversification of the Nigerian Economy: From Over Dependence on Oil Exports.” The former president expressed concern that the share of intra-African trade in Africa’s total trade over the past decade was only about 12 per cent compared to 65 per cent of Asia.The VP further hinted that the federal government is already encouraging a privately owned oil refinery firm in the country which would refine 650, 000 bpd towards easing the petroleum products’ supply and accessibility in Nigeria. According to him, when the privately owned refinery project is completed, Nigeria would be saving about 30 percent of the amount it spends on importation of refined crude into the country.